The Certified Plant Professional (CPP) program was originally developed by the Idaho Nursery & Landscape Association (INLA) and the Montana Nursery & Landscape Associations (MNLA) to improve the professional qualifications of persons employed in the horticultural industry. Through this program, certified plant professionals are recognized by the gardening public as well as within the industry. Individuals who become certified are designated as “Certified Plant Professionals” within the states of Idaho and Montana. Successful CPPs are presented with a certificate and engraved name badge to recognize their accomplishment. MNLA also provides press releases to assist CPPs and their employers in getting local recognition. Additionally, MNLA has some cash incentives available to members who promote their employees’ involvement in the program through advertising. Certified professionals must be knowledgeable in a wide variety of horticultural subjects including plant identification, soils, fertilization, turfgrass management, proper planting techniques, landscape design and more. Knowledge of these subjects can be gained through professional experience and study of the MNLA Certification Manual. Improve the professional qualifications of nursery industry employees in Montana. Provide special recognition to individuals who have demonstrated a high level of knowledge in principles and practices of the industry. Facilitate the education and training of new employees. Encourage and promote continuing education and training of all nursery-related industry employees, including owners and managers. 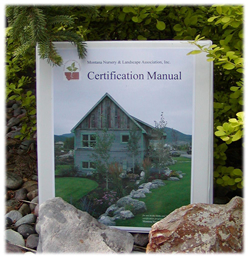 Provide the Certification Manual as an information source for the nursery industry in Montana. Applicants for Certification must have worked in the nursery industry for at least one year. Anytime thereafter, an applicant may submit the appropriate documentation and fees to take the exam at the next scheduled time. You do not have to be an MNLA member or an employee of an MNLA member firm in order to acquire certification by MNLA. Eligible applicants need to submit a completed application, documentation of nursery employment and the appropriate fees to the MNLA Executive Director by the published deadline. MNLA will notify each applicant of the time and location of the exam. The certification tests are generally given twice a year, in January at the annual Montana Green Expo and in August or September at the MNLA annual Fall Tour. The exam consists of a plant identification test and a written test. The exam is based on the Certification Manual and on practical information gained from employment in the industry, and on identification of the correct genus, species, common name, and cultivar (if appropriate) for each plant. The ID portion of the exam is based upon plants covered in Choosing Trees and Shrubs for Montana Landscapes, by George Evans and Alan Epps, as well as lists of Montana perennials and woody plants. These publications and lists are included in the manual. The second portion of the exam is a 200 question written exam of the principles and practices of virtually all aspects of the nursery industry. A passing grade is 75% for both parts of the exam. Bring at least two sharpened pencils to take the exam. We also recommend that you bring several sheets of scratch paper. MNLA strongly recommends the CPP Certification Manual as a study guide for all individuals preparing for the written exam. The manual is a programmed learning manual. There is a study guide at the end of each chapter to reinforce the main points of the chapter. The manual contains more than 20 chapters on subjects including soils; planting; plant care; insect, weed and disease management; fruits; turf; marketing; and the Montana Nursery Law. Each chapter was written by individuals with extensive practical or academic knowledge of the subject matter of the chapter. The manual is an excellent source of information as well as an aid for exam preparation. Certification manuals may be purchased and exam application may be done online or through the MNLA office for $100 for members and $200 for non-members. As with most of MNLA’s products and benefits, candidates who work for MNLA member firms (or who are themselves MNLA members) receive a discount on test application fees. There are two exam segments, a written exam and a plant identification segment, which may be taken at the same time or at different times. Member registration fees for the exam are $50 per exam segment; non-member registration fees are $100 per exam segment. Payment for the CPP exam must be received no later than 15 days prior to the exam date. Cancellations received 5 business days before the exam will receive a 50% refund. Cancellations received after the 5 business day cut-off will not be refunded. Exam results (scores) are mailed to each exam participant within approximately two weeks of the exam date. A passing score on either part of the exam is good for five years. Individuals who pass only one portion of the exam, but who do not become certified within five (5) years will be required to again pass all portions of the exam before they are eligible to be certified. Click here to see the current list of CPPs. If you have been certified through MNLA’s program, be sure to advise us if you change addresses or employer, so that we can notify you of your certification expiration date and/or of any changes to the certification program. Certification as a CPP by the MNLA does not currently transfer to certification status through any other state Association certification program. In January of 2003, MNLA members passed a motion that requires all Certified Plant Professionals (CPP) to renew their certification. The Education Committee’s intention in initiating this requirement was to ensure that once an individual obtains the “CPP” title, he/she continues relevant education in order to maintain the expertise that qualified him/her as a CPP. The education requirement for CPP renewal maintains the credibility and integrity of the certification program. Successfully pass the plant identification exam again (worth 25 points). Attend MNLA Montana Green Expo seminars (seminars are worth 1 point per hour). Sign in sheets will be circulated. Participate in relevant community outreach work such as school programs, garden clubs, extension service, senior centers, etc. Outreach is worth 1 point per hour of activity. Mentor certification students by participating in company-sponsored classes or working one-on-one with candidates. Mentoring is worth 1 point per hour of mentoring. CPPs have five (5) years from their certification date to renew their certification in accordance with the education requirement stated above. CPPs may renew their certification any time prior to the deadline if they have met the education requirement and submitted a renewal form. Renewal will not be required again until five years after the deadline. Renewal forms are available from the MNLA website or upon request from the MNLA office. To renew, complete the renewal form and submit it to the MNLA office. Do not submit a renewal form until you have completely met the 25 point requirement. Documentation which supports the activities reported on the renewal form is appreciated, but is not required. CPPs are encouraged to honestly report the required renewal activities and the hours they were involved in those activities.